The 6S Standard is a process for creating and maintaining an organized, clean, and high-performance workplace. This then serves as a foundation for continuous improvement activities. 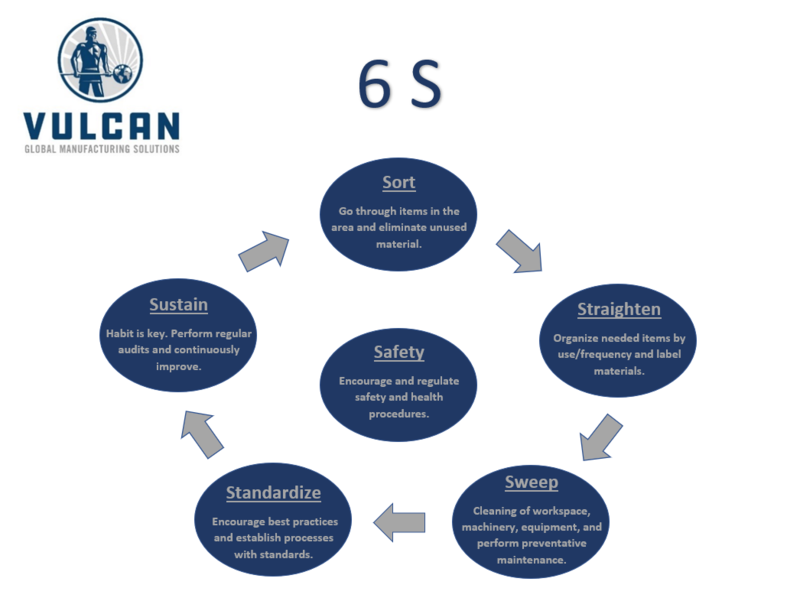 At Vulcan, we embrace this standard and make safety a key point of our 6S program. Since safety is paramount to our organization, it is first on our list of standards. Safety: Throughout the entire process, safety is number one. This includes two daily safety meetings, near miss reviews, open mic reviews and monthly reporting. Sort (from the Japanese word Seiri): Aimed to eliminate the unneeded from the work area and perform the initial cleaning. Straightening (from the Japanese word Seiton): Arranges the workplace to ensure safety and efficiency. Systematic Cleaning (from the Japanese word Seiso): Systematic daily cleaning means inspection of work areas and equipment to understand conditions and determine if corrective action is needed. Standardize (from the Japanese word Seiketso): Aims to make abnormal conditions noticeable and to document agreements to ensure consistency and sustainability. Sustain (from the Japanese word Shitsuke): Aimed at maintaining the improvements from the other 5S activities and improving further. Quality is a fundamental part of the Vulcan GMS organization and we take that seriously. From start to finish, quality is a key element in our processes. In 1999, we became the first non-ferrous foundry in the U.S. to meet that standard and become ISO certified. In 2008, we were registered to the new standards, and we continue to make quality a top priority for our customers. 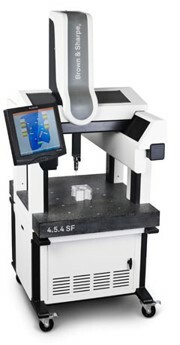 We have a wide variety of quality equipment, from manual tools to coordinate measuring machines (CMMs). Our CMMs are all kept up-to-date with the newest software, providing a universal platform and improved programming time. We are focused on quality and continue to invest in this area. Click here for a list of the major pieces of quality equipment we have in our facility. The current “take-make-use-throw away” model of consumption means that as the world population increases the demands for primary resources will become increasingly unsustainable. It is therefore essential to return materials at the end of their life back into the market. Lead has the highest recycling rate of all metals, plastics, or paper. In fact, it is the most recycled material on the planet by weight. This is a result of its fundamental properties, good design and the ways in which it is used – all of which make lead-based products economic to recycle and re-manufacture. As a result, most of the lead produced and used each year throughout the world has been used before in other products. What’s more, because lead is a naturally occurring element, the quality of the recycled lead is identical to that of primary metal from mining. At Vulcan GMS, we are committed to environmental sustainability and we keep this commitment by offering recycling and return programs. We also recycle all lead manufacturing excess at no cost to you. Our lead recycling effort makes an important contribution to sustainable development, easing the pressure on non-renewable resources and reducing carbon emissions through an energy-efficient recovery process. Please contact us with your recycling needs.